Look, I get you went to a state college. So did I. Stop beating yourself up about it and use your degree. Use your degree to broaden your business reach by searching for alumni with similar interests to yours. Most alumni are usually very willing to connect with or help their fellow alumni. The typical path for a LinkedIn recommendation is 1) You get fired or leave your current company 2) You then ask (beg) one of your former colleagues for a recommendation. Don't go down that path. Get up early one Saturday morning, treat yourself to Starbucks, and use their free Google provided WiFi. Instead of scrolling through Facebook, write some unsolicited recommendations for current and former co-workers. Expect nothing in return. I repeat, expect nothing in return. Karma - 'tis better to give than receive. Unless you're talking chocolate or ice cream, then I need to be a receiver. Definitely. 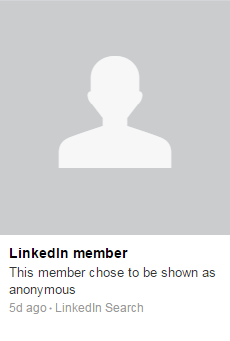 There is an option to make your profile anonymous. Don't be that guy. Or gal. 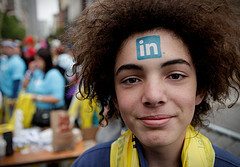 The driving purpose of LinkedIn is to connect. When you anonymize, you miss opportunities. "But Roman, I absolutely have to spy on a former colleague!" Really? No you don't. And no you shouldn't. Be real. Be transparent. ABC - Always Be Connecting.